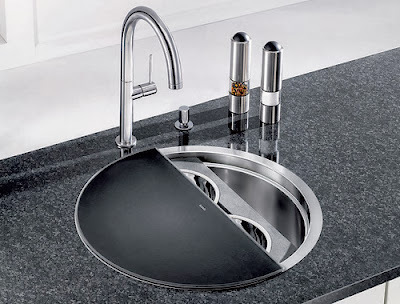 Pictures of kitchen, bathroom countertops, backsplash, shower wall and custom flooring designs with Granite, Quartz, Vetrazzo and natural stone. 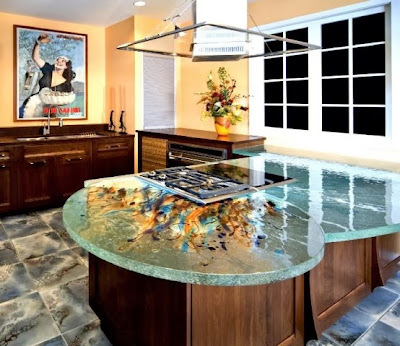 All about natural stone trends. 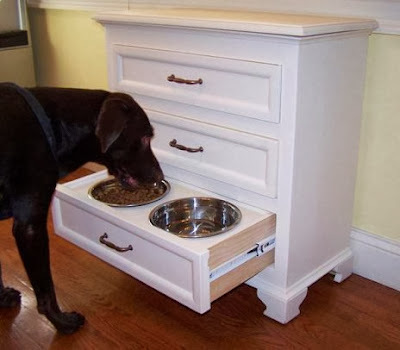 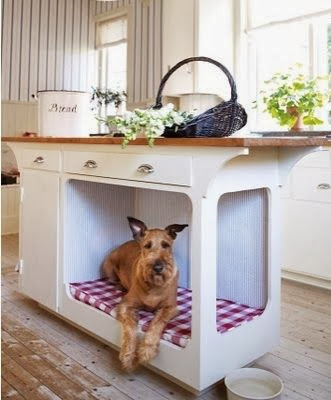 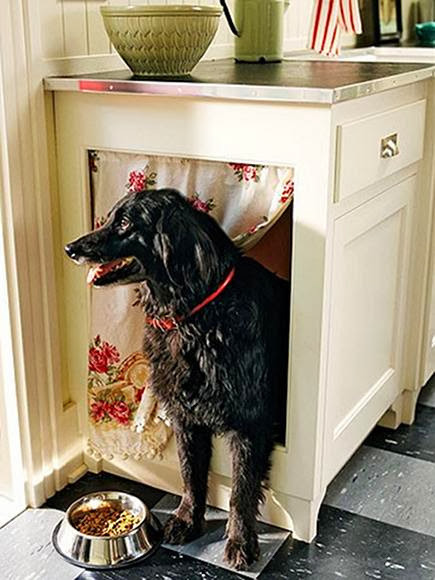 I love this idea it ensures to use all the kitchen space that we thought lost, despite having pets in the kitchen and the nook is contained and of contact with food. 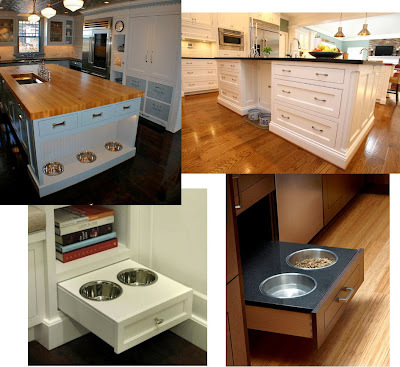 What do you think about clever and functional kitchen designs? 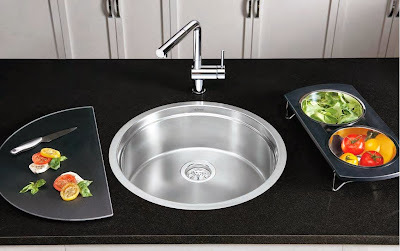 If you want a unique and special kitchen accessory, something that will make your kitchen design pop from others, this multi-functional circular shaped Ronis-Blanco kitchen sink could be it, very useful accessories that fit in the kitchen faucet to save space, on top of that it rotates easily for more versatility. 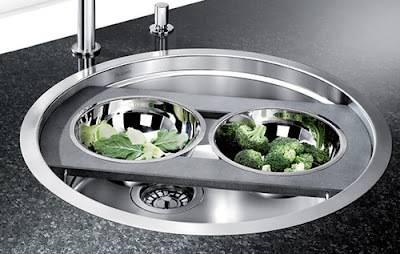 This sink features a round glass chopping board and a bridge with two stainless steel recipients. 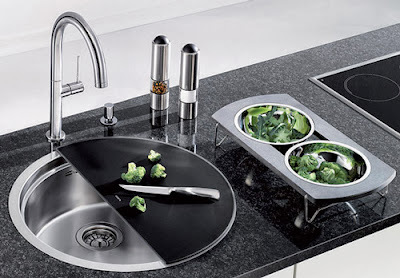 This is a contemporary kitchen design that goes great with a modern style combined with granite countertops or the material of your choice. 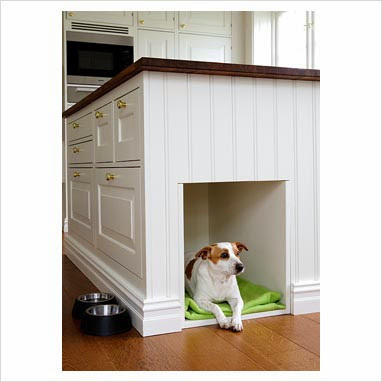 Visit our CONTEMPORARY section for more designs like this one. 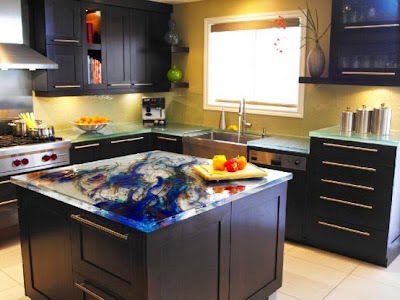 Kitchens with glass countertops will give your design a very artistic and luxurious feel that will turn your kitchen into subject of admiration and conversational design . 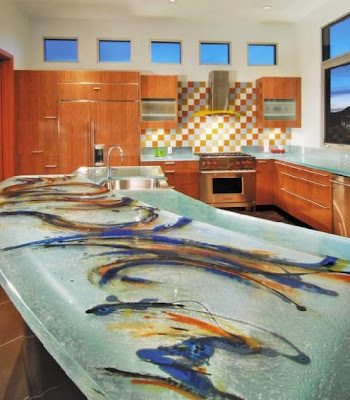 Glass countertops by ThinkGlass let you create a truly unique design available in different colors and also can be decorated with beautiful motives and in various thicknesses from 1.5 "to 4". 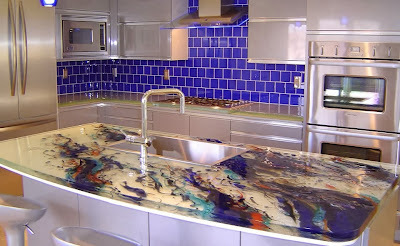 They are custom made of pure glass or with artistic finishes and in different colors. 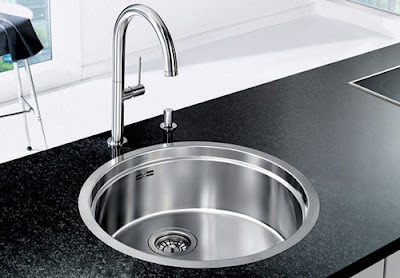 They also offer different finishes for surface and edges. 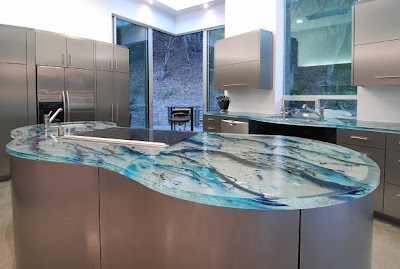 We must not confuse these glass countertops with Vetrazzo countertops, they are relatively similar in concept and based on the same material but at the same time very different. 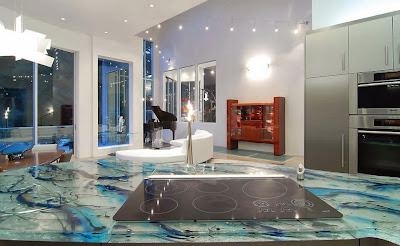 Vetrazzo transforms recycled glass into exquisite countertops with bits of compact glass of different colors and other additives glass, while the tops of pure glass but also made ​​from recycled glass, the color is obtained through a careful process of hand-paint, allowing get a unique design. 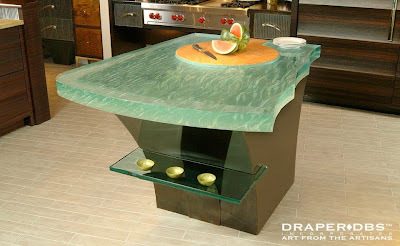 These glass countertops are stronger than granite countertops . 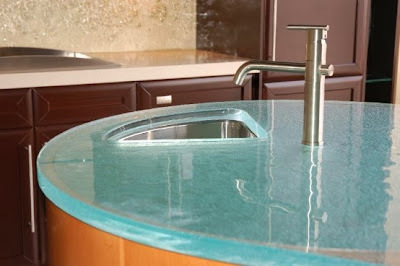 According to ThinkGlass, these glass countertops can withstand up to 1800 pounds in the middle of a 26" wide countertop, also highly resistant to heat without cracking and impossible to stain. 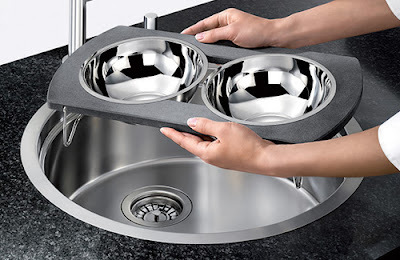 They tend to be more hygienic due to its nonporous surface, which facilitates cleaning and prevents accumulation of bacteria. 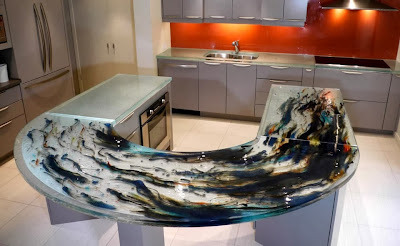 Another advantage of these glass countertops is that they do not need lamination which will reduce the cost of labor by reducing preparation time compared with that of granite countertop, also it will reduce the lamination material cost. 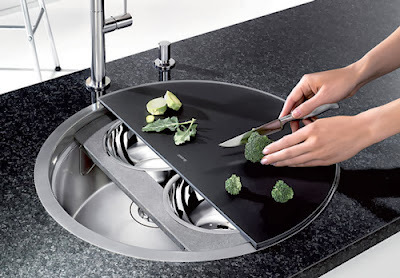 They do not contain any kind of radiation as granite does, even though is claimed to be minimal in granite. 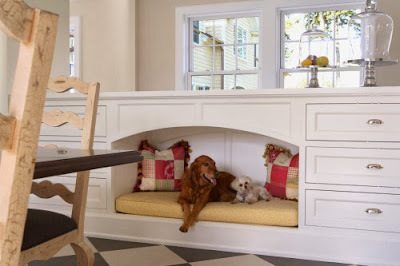 I found this functional small kitchen design, kitchenette, in housebeautiful com by the designer Stephanie Stokes, and I loved it!!. 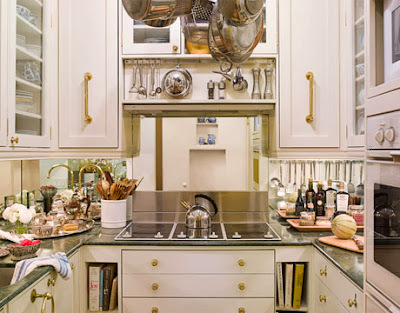 The design incorporates the mirror in the backsplash to give the illusion of more space and to give more depth to the design and to capture light from every angle. 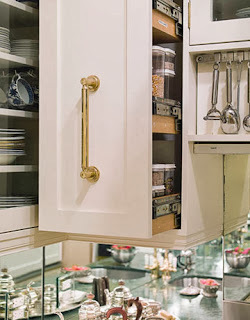 Another element to visually enlarge a space is the addition of light colored cabinets, in this case white cabinets. 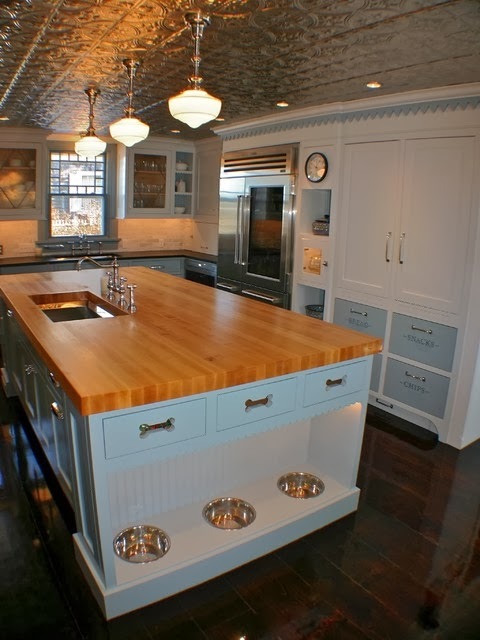 The designer paid a lot of attention to details to make this a super functional kitchen design where space is limited such as: flat cook top stove chose specifically to have double function: oven and countertop. 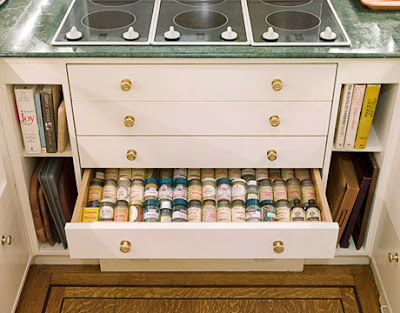 Sliding cabinets that maximize the space on each side with organizers., sliding drawers under the stove and storage space for cookbooks and trays. 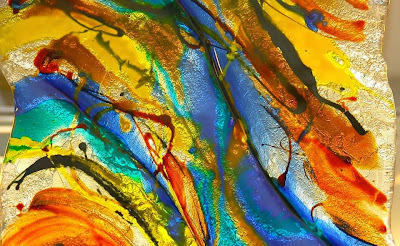 You might also like this blogs..